National Prohibition saw some of the more curious stamps or stamp related emissions emanating from the Bureau of Engraving and Printing. 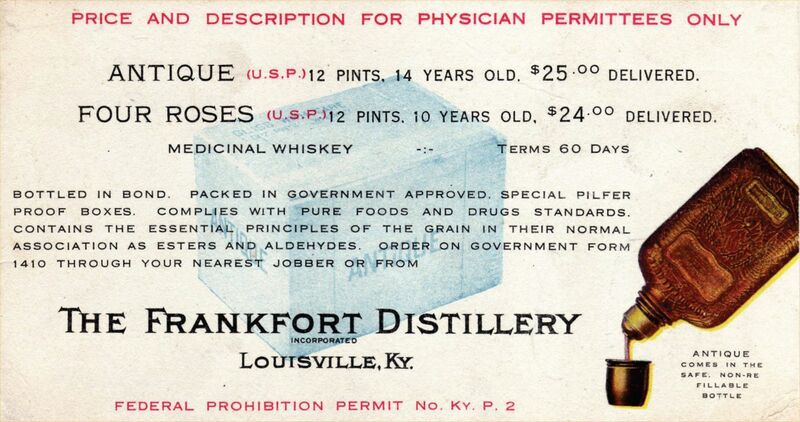 There were Nonbeverage distilled spirits taxpaid stamps, doctors’ prescription blanks for medicinal alcohol, alcohol warehousing stamps, and the unique quarter pint bottle stamps for bottled in bond distilled spirits. These latter stamps are the subject at hand. When National Prohibition descended on the nation on January 16, 1920, there were three ways that beverage alcohol could be obtained legally: sacramental wines were allowed, medicinal distilled spirits and wines could be prescribed by a physician, and the male head of the household was permitted to produce 200 gallons of wine for his household. The bottle stamps that once graced all bottles of distilled spirits are technically not taxpaid stamps, even though many of them said “tax paid” on them. State revenue stamp collectors long ago dubbed these liquor seals. The distillers paid a flat fee of 1/2¢ for these bottle stamps for bottles of a half pint or larger regardless of the bottle size and the amount of tax that was due. The actual taxes were assessed and paid through a reporting system. The stamps served to seal the bottle to show that they were properly accounted for. In the case of bottled in bond liquor, this meant that the spirits could be stored in a bonded warehouse for eight years before the taxes had to be paid. In the event that the spirits were removed for sale, the taxes were due immediately. The payment of the taxes was usually indicated with ink applied with a stencil on the case stamp. The bottled in bond bottle stamps in use at the beginning of Prohibition still had the word “Tax Paid” as a central part of the design, but by 1922 these words were removed from the stamps. Only two sizes of bottles were permitted by this time, a half pint and a pint. This was a convenience to the pharmacists who filled prescriptions for medicinal alcohol, the maximum quantity for a 30 day prescription being a pint. The distilleries were very eager to fill orders for medicinal alcohol, principally spiritus frumenti (spirits of grain), commonly known as whiskey. But by 1924 the distilling industry had convinced the government to permit a smaller bottle, the quarter pint (a mere 4 fluid ounces) that physicians could supply to their suffering patients. In this way relief was on the way as the patient left the office and before they could go to their neighborhood pharmacy to get their prescription for spiritus frumenti filled. In the spring of 1924, as a prelude to the quarter pint, at least one distillery, E. H. Taylor near Frankfort, Kentucky, apparently acquired government permission to bottle their whiskey in 1/10 pint bottles (fi gure 3). The scarce example of the 1/10 pint bottle stamp has had its bottling and production dates obliterated and new dates overprinted. During 1924 the quarter pint was officially sanctioned and bottle stamps were produced (fi gure 4). The fi rst key feature of this stamp is that the words “Tax Paid” have been removed from the center, a change that was initiated with the half pint and pint denominations of the bottle stamps of the Series of 1922. This change was initiated by Internal Revenue and certainly was meant to convey the changes brought on by National Prohibition. The keen observer will note also that the bottling date on this example is Spring 1923. How can this be, if the quarter pint bottle was not permitted before 1924? The most likely scenario is that the whiskey had been bottled originally in 1923, was dumped, and then rebottled in the new smaller containers. The Series of 1924 quarter pint stamp was to be in use only about two years before a government reorganization created the Bureau of Prohibition as the agency overseeing all alcohol production in the country. The Series of 1926 Distilled Spirits Bottled in Bond included case and bottle stamps for the three permitted sizes, quarter pint, half pint, and pint. By far, the most common size stamps aailable to today’s collectors is the pint stamp. After all, who would want a physician to prescribe a half pint, when a pint was permitted. Both the half pint and quarter pint stamps are decidedly uncommon. The series of 1926 stamps show a return to a serial number printed on both the case stamp and a number on each of the bottle stamps. The long part of the number is a case number, which is believed to be unique regardless of the bottle size. That is, if a distillery ordered stamps, the first case got case number 1, the second 2, and so on. Case number one might be a case of half pints and case number two might be pints. So the stamp shown in Figure 5 is from case number 322028 and it is the sixteenth bottle in that case. Since the case was of quarter pints, the bottle numbers would have ranged from 1 to 96. In the spring of 1933 the case and bottle numbers were eliminated from these stamps, a casualty of the cost cutting of the Depression and the realization that Prohibition’s days were numbered. The Act of March 22, 1933 had redefined intoxicating beverages as exceeding 3.2% alcohol (from the 1/2 of 1% that had been in the Volstead Act). 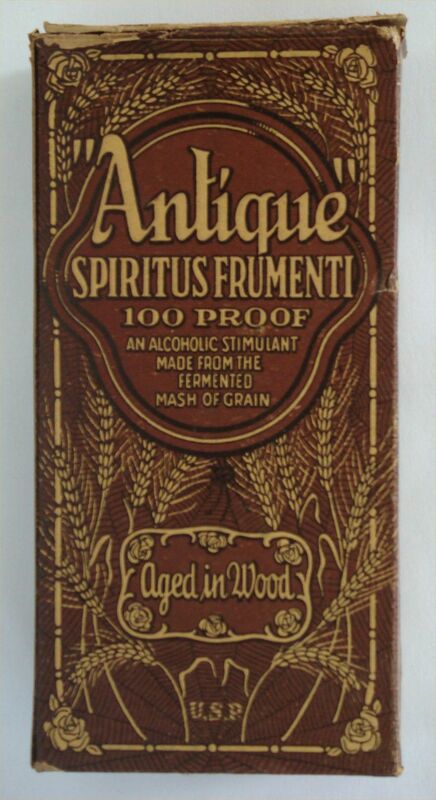 We see a typical cardboard box which contained a bottle of spiritus frumenti. A surprising number of boxes containing their original containers seem to have survived the Prohibition years, possibly from either physicians’ offi ces or from pharmacies. Figure 7 shows the bottle from the cardboard box. 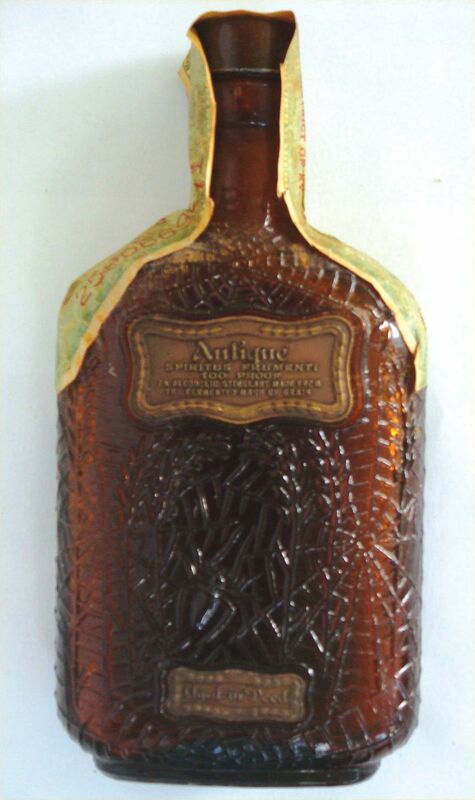 Although the bottle has never been opened, more than half of the liquid contents have evaporated from the container. The repeal of the 18th Amendment did not end the Prohibition Era in all states. New case and bottle stamps were ordered that eliminated the words Prohibition on them. These stamps of the new Series of 1933 continued to include the quarter pint bottle size, presumably because they were needed in those states where distilled spirits were still not permitted for sale. Kentucky, the producer of bourbon, was still a dry state on December 5, 1933, the day when the 18th Amendment was repealed). By July 15, 1936, distilled spirits were still not legal in Alabama, Georgia, Kansas, Mississippi, North Dakota, Oklahoma, and Tennessee. The quarter pint bottle stamp of 1933 certainly saw little usage and remains one of the great rarities of the distilled spirits bottled in bond stamps and a reminder of the colorful era of National Prohibition, an era that continued to survive in some states (distilled spirits remained illegal in Mississippi until 1966! ).